Sen. Bernie Sanders was at Plymouth State University in Plymouth, N.H., on Tuesday. 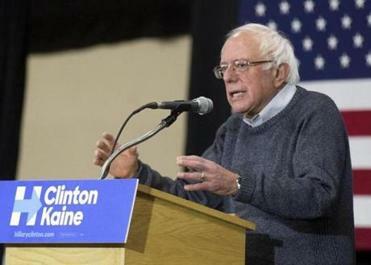 PLYMOUTH, N.H. — Senator Bernie Sanders started a cross-country campaign tour for his former rival Hillary Clinton Tuesday, deliberately steering clear of the cascading controversies engulfing the Democratic nominee for the White House in the final days of the election. Amid the furor over the federal investigation into Clinton’s use of a private e-mail server and the continuing release of hacked e-mails from her campaign, Sanders urged voters to stay focused on the issues facing the country — including the battle for control of the Senate — and not the campaign scandals. With Election Day less than a week away, both campaigns have begun revving up their get-out-the-vote strategies, imploring voters to head to the polls on Tuesday, especially in key battleground states like New Hampshire. Wearing a neon-green T-shirt emblazoned with “nasty woman” on the front — an homage to a dig Trump made at Clinton during the final presidential debate — Susan Jayne of Thornton, N.H., said the recent controversies strengthened her support for Clinton. She canvasses for her daily and said she plans to knock on even more doors in the final days of the campaign. Senator Bernie Sanders has been going after pharmaceutical companies over drug prices. Richard Osborne, a candidate for state representative in Campton, N.H., said last week’s news of the FBI probe and the leaked e-mails are a “last-minute” attempt to embarrass Clinton. Too much attention has been paid to such attacks, Sanders said. So for nearly 30 minutes, the senator from Vermont laid out the differences between the Democratic and Republican platforms and the parties’ standard-bearers on everything from climate change to pay equity to dismantling economic inequality before a crowd of about 400 people at Plymouth State University. Trump acknowledged during the second presidential debate that he took advantage of a tax loophole that allowed him to avoid paying federal income tax for nearly 20 years as a result of a reported $916 million loss in 1995. Democrats are also fighting to regain control of the Senate on Nov. 8, Sanders noted, and New Hampshire is a state that could help sway the balance. Democratic Governor Maggie Hassan is battling incumbent Senator Kelly Ayotte, a Republican. And while recent polls show Clinton leading Trump in New Hampshire, the race between Ayotte and Hassan is a tossup. Ayotte has since said that she would not vote for Trump after numerous women came forward alleging that he sexually assaulted them and Trump was heard on video bragging about groping women. That point — the role of Congress in advancing a legislative agenda — underscores one that Gary Moody of Milford, N.H., said he’s tried to make throughout the entire 2016 campaign season to whoever will listen. An independent voter, Moody plans to protest Trump by casting his ballot for Clinton.